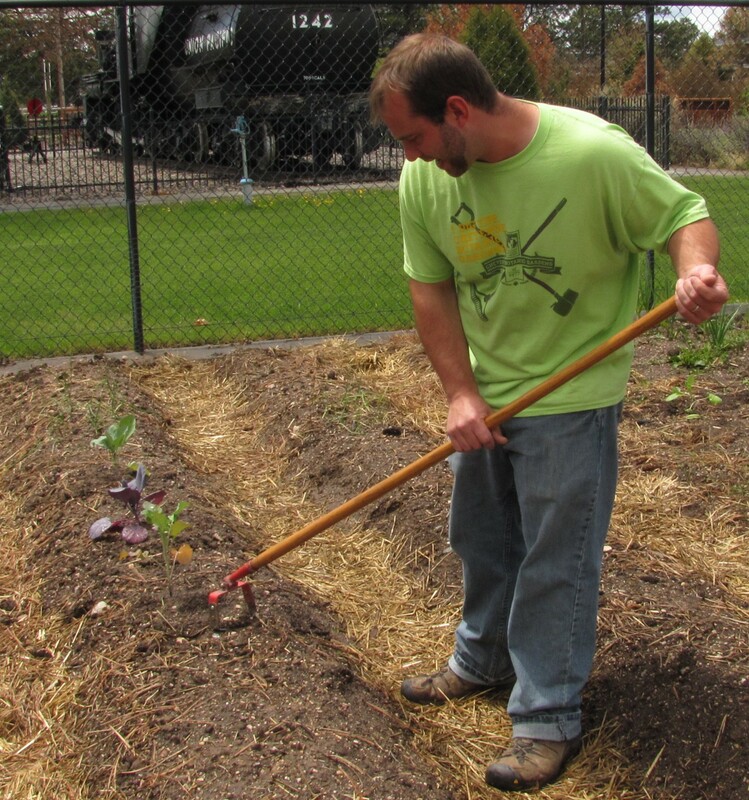 Tyler Mason, Cheyenne Botanic Gardens’ horticulturist, demonstrates use of the stirrup hoe in his wide beds in his plot at the community gardens. Photo by Barb Gorges. Published July 12, 2015 in the Wyoming Tribune Eagle’s Journey section: “Can you weed out the weeds? Try these strategies to get your lawn and garden in tip-top shape. 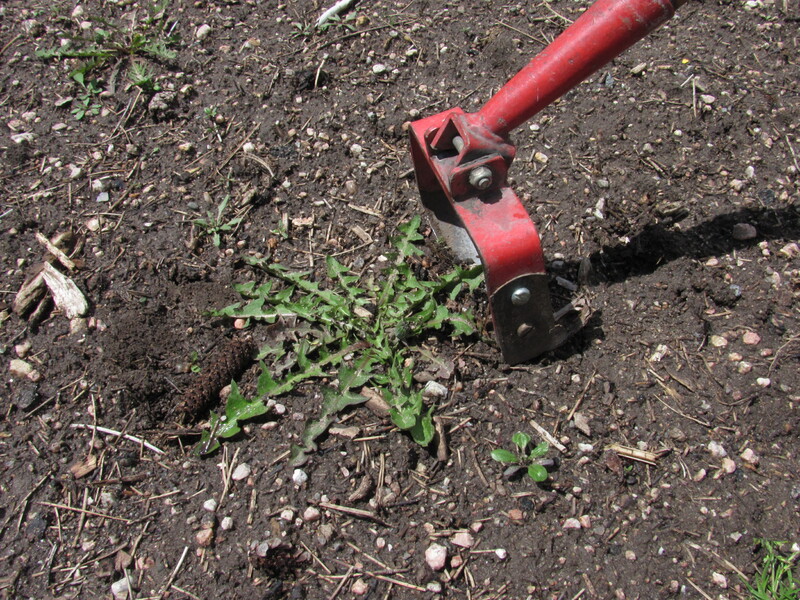 “A year of weeds leads to seven years of hoeing.” –Folk saying recounted in “Sustainable Horticulture for Wyoming,” University of Wyoming Cooperative Extension Service. The penstemon in my perennial flower garden is creeping into the lawn. The grass is creeping into the flowers. Technically, that means both penstemon and grass are weeds—out-of-place plants. Besides growing where they are unwanted, most weeds are aggressive, crowding out preferred plants and even reducing the productivity of vegetables. Often native to Europe or Asia, coming here accidentally or intentionally, they seem to outpace even native plants, excelling where ground is disturbed. Unfortunately, weeds aren’t usually as edible as our vegetables or as beautiful as our flowers. But for a different outlook, check out “The Wild Wisdom of Weeds” by Katrina Blair, a Colorado gardener. I recently visited with Tyler Mason about strategies for dealing with weeds. He is now the Cheyenne Botanic Gardens’ horticulturist. He practices integrated pest management, opting for the least toxic, but effective, methods to control weeds. 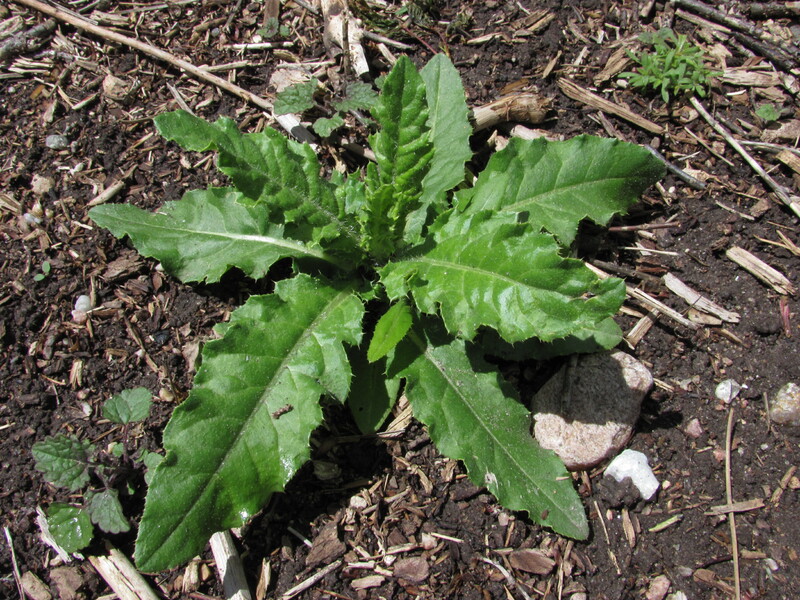 Canada thistle may require several applications of appropriate herbicide to eradicate it. If you chose not to poison it, don’t let it flower and spread seeds. Photo by Barb Gorges. The two biggest weed pests in gardens here are field bindweed and Canada thistle. Both develop extensive roots. And any tactic that doesn’t remove or kill every little piece will increase their vigor. Creeping bellflower (Campanula rapunculoides), with stalks of multiple lavender bell-shaped flowers, runs a close third because it spreads too well. Also on Tyler’s list: dandelion, curly dock, crabgrass, plantain, and common groundsel. The book “Weeds of the West” is a great field guide to weeds in gardens, cropland and rangeland. Manure is great fertilizer, Tyler said, but not if it still has viable seeds when not thoroughly composted. Sometimes, weed seeds may come with plants you bring home. Plantain, native to Europe, is a shallow-rooted weed that likes bare, compacted soil, thus its nickname: “white man’s footprint.” One plant can produce 20,000 seeds. Photo by Barb Gorges. There are hundreds of seeds lying dormant in the soil just waiting for a bit of sunlight. Tilling the vegetable patch brings them to the surface. No-till gardening is becoming more popular. Once a bed is built, the soil and its micro-organisms are allowed to do their thing, improving soil structure and fertility. Amendments are added as top-dressing. In the Botanic Gardens’ community garden Tyler is using wide-bed gardening in his plot this year instead of the traditional rows. Each bed is a berm about 6 inches high by 2 to 3 feet across, running the length of his garden. Access paths on either side are well-mulched with straw, reducing the area needing to be weeded. By not stepping on the berm and compressing it, the soil holds more water. “Be effective with your water,” Tyler said. Water right where you need it. Same with fertilizer–don’t broadcast it over the garden, otherwise the excess will feed the weeds. The stirrup hoe, pushed or dragged so that its sharp lower edge is barely under the soil surface, severs weed seedling roots. Because it disturbs so little soil, fewer new weeds will follow. Photo by Barb Gorges. If your garden has any bare soil, you are bound to see weed seedlings. Pull them right away. Even thistle and bindweed are easy to pull, roots and all, when they are less than 2 inches tall. To disrupt seedlings while you are in a standing position, use a stirrup hoe like Tyler does, pulling it through the top quarter-inch of soil to severe the roots. How do you know which is a weed seedling and which is a vegetable seedling? Plant seeds in a pattern. Or give your garden an advantage over weeds by transplanting starts rather than direct seeding. Black plastic sheeting, with holes cut for inserting vegetables, is a way to mulch. Used with drip irrigation and soluble fertilizers, it can be pricey. Weed barrier cloth is often used for landscape plantings. But it can make it harder for the roots of desired plants to get water and nutrients. Over time, dirt blows in on top and weeds sprout anyway. Rock mulch is popular these days, but it doesn’t contribute nutrients the way a mulch of organic materials can, like bark. 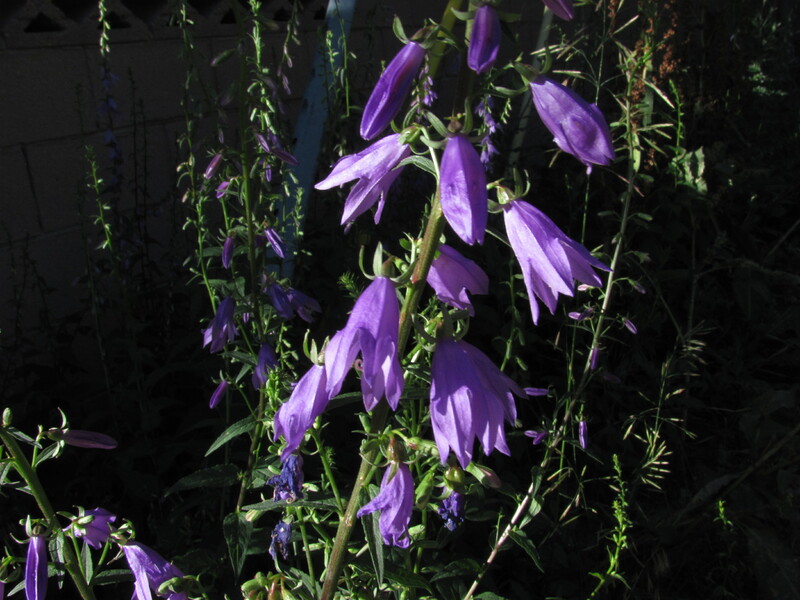 In Cheyenne, creeping bellflower is quickly taking on a reputation similar to bindweed. It spreads and is difficult to eradicate. Photo by Barb Gorges. In flower and veggie gardens, Tyler recommends materials that compost quickly and can be turned under, like grass clippings, tree leaves, straw (not hay with seeds). Take care they are not from diseased plants. Also, make sure they were not sprayed recently with herbicides. 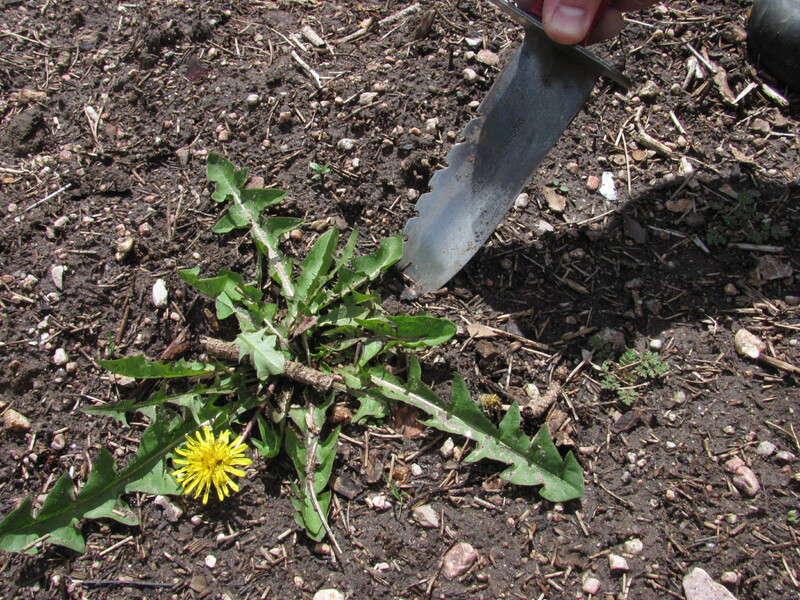 Weeds that poke through are easier to pull because the soil surface has not been baked by the sun. Another way to keep weed seeds in the dark is to grow more densely—keep the ground shaded. Maintaining a healthy lawn cut about 3 inches high will shade out weeds, Tyler said. It is amazing how many seeds one weed can produce. The master gardener manual says dandelions have 15,000 seeds per plant. Don’t let weeds flower. If you don’t have time to remove them, deadhead them by hand or mower. The hori hori knife, a Japanese garden tool readily available here, is good for removing bigger weeds. It has a sharp edge on one side and a serrated edge on the other. Photo by Barb Gorges. Tyler is fond of the hori hori knife, a traditional Japanese garden tool that looks like a narrow, pointed hand trowel with a sawtooth edge on one side. This is a good tool for weeds that breach the mulch, are too big for the stirrup hoe, or that have roots about as deep as the hori hori is long. When I was a range management student, I learned that cattle prefer forbs (wildflowers) over grass. They will nibble these “ice cream plants” to death if left in a pasture too long. Conversely, they could be trained to eat weeds. So if you have thistle and bindweed in your garden, keep removing the green leafy parts as often as you can and eventually the plants can very well starve to death. At least they won’t spread. If you have an over-grazed pasture full of weeds, please consult the Laramie County Conservation District. 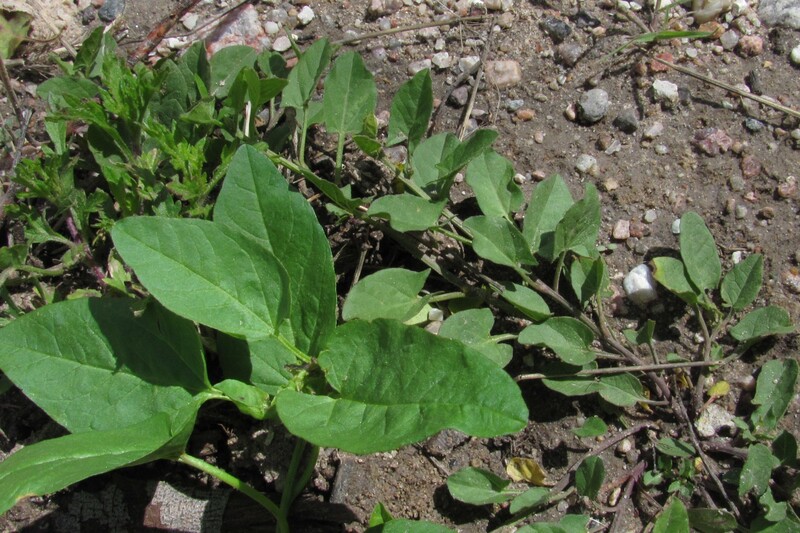 One of the most difficult weeds to kill, field bindweed grows bigger leaves in more fertile soil. Tyler Mason likes to isolate bindweed from non-target plants by coiling up the vines in a cup with a hole in the bottom, and then spraying it with an appropriate herbicide. Photo by Barb Gorges. There might be a situation that justifies using herbicides. But first, you have to find the right one for your weed, so you must be able to identify it. Then you must follow the directions exactly as to formula strength, timing and weather conditions. Keep in mind that some herbicides will volatize—turn to toxic gases—when temperatures are more than 85 degrees F and then will blow onto non-target plants, the neighbors, your pets or yourself, Tyler said. He doesn’t recommend broadcast spraying or using feed and weed products. It can lead to toxic runoff which pollutes surface and ground water. Spot treat instead. Exceeding herbicide label recommendations is another problem. It can burn the top of the plant, not allowing the plant to transfer the toxin to its roots—and so it re-sprouts instead of dying. Finally, be sure to deadhead weeds before spraying so that bees and butterflies won’t be poisoned by poisoned flowers, Tyler said. I heard that a concrete curb poured around the edge of a flower bed can be breached by grass. I’m trying this solution, edging a bed with flagstones flush with the lawn. The lawnmower can run two wheels along them and no string trimming is necessary. However, in the spring, or whenever grass shows up between the stones, I can upend them and take a shovel to the white root-like grass stems, known as stolons, and cut them back. Another advantage over concrete curbing: I can change the size and shape of my flower beds whenever I like. Gardening is about discrimination, discouraging some plants and favoring others. Vigilance is important. But is there a gardener who doesn’t enjoy an excuse to spend time out in the garden? Categories: Garden maintenance, Gardening, Lawn care, Mulch, Uncategorized, Weeds | Tags: bindweed, Cheyenne Botanic Gardens, dandelion, deadhead, garden, gardening, herbicide, hori hori, mulch, plantain, stirrup hoe, thistle, Tyler Mason, weed barrier cloth, weeding, weeds | Permalink. My season-long experiment to raise “Gold Nugget” yellow cherry tomatoes and cosmos from seed has cleared a major hurdle: transplanting. When moved to its outdoor spot, the cosmos never even wilted a leaf. One tomato with a damaged stem is growing fine. I’d made a little trench to lay it in and buried it completely, except for the top tuft of leaves. Along with the tomatoes and cosmos, heliotrope, strawflower, eggplant, red cherry tomatoes, squash, pumpkin and gourds–the rest of my seed starting efforts—are growing in my garden. Now the plants and I have settled in for three months of watering, weeding and waiting. The first thing I noticed after transplanting is that my vegetable garden layout doesn’t make for easy hose watering. I have to admit my wide bed design was influenced by the photo my son, Jeffrey, sent of his and his housemates’ garden. But I would imagine in Seattle, they seldom irrigate. While my perennial gardens have done just fine over the years being next to the lawn sprinkler system, I’ve discovered the closest sprinkler head doesn’t reach the back of the vegetable garden. There’s also the accepted wisdom that you should keep water off the tomato leaves to reduce spotting and rotting. (Good thing it doesn’t rain much here.) Plus, I would expect the pet sitter will charge double if she has to haul the hose around the yard whenever we are away. All spring, I’ve been attending lectures sponsored by the Laramie County Master Gardeners and reading books by gardeners from Colorado’s Front Range. The advice is always the same: drip irrigation. Besides, it can use 30-50 percent less water than sprinklers. Turns out even the Seattle garden is set up for drip. This is the method in which you lay out plastic tubing with little holes lining up with the plants which lets water soak into the ground rather than spray into the air with much of it blowing away. When I look at the vast expanses of bare ground between vegetable plants—which will presumably be filled as the plants grow, it makes sense not to waste water on unplanted ground—it would benefit only weed seeds. My plan is to check out what drip irrigation systems are available locally and compare them to my notes. You can read similar notes at http://www.ext.colostate.edu/PUBS/Garden/04702.html. I’ll need a fitting that splits the water at my backyard faucet so that I can continue to use the hose when I need it. I’ll also need a backflow preventer, filter and pressure regulator. Then there’s the ½-inch or ¾-inch flexible plastic tubing to take the water along the edge of the lawn out to the vegetables. For each plant I’ll plug in short pieces of micro-tubing with an emitter on the end—that gives me the flexibility to change things next year. The hard part is figuring out how long to run the water to get an adequate amount to each plant. If spells of drying winds or heavy rainstorms don’t have to be taken into account, a battery-operated timer can be inserted. The pet sitter would like that. But, you ask, who wants to see black plastic tubes all over their garden? The answer is covering them with mulch, which is also the answer to weeds. In 30 years of gardening, here and southeast Montana, my worst weeds were the unwanted aspen sprouts in the lawn after we cut down the trees. The best control was pulling them for two summers. They disappeared after that. No poison required. My perennial beds, about 200 square feet total, are converted lawn. Other than grass invading the edges, they have never had more than the occasional thistle or bindweed seedling, maybe a sprouting chokecherry pit deposited by a passing bird. And that’s the key—catch weeds while they are small. Go out to admire your garden often and the interlopers will be easy to spot. Also, it’s easy to pull weeds out of healthy soil high in organic matter. In a small garden, forget the hoe—it just brings more weed seeds to the surface to sprout. But on the other hand, if you see a weed you don’t recognize in your flower garden, let it grow. I had one turn out to be an unusual pink columbine. It’s happy in that shady corner and growing better than other plants I tried there over the years. 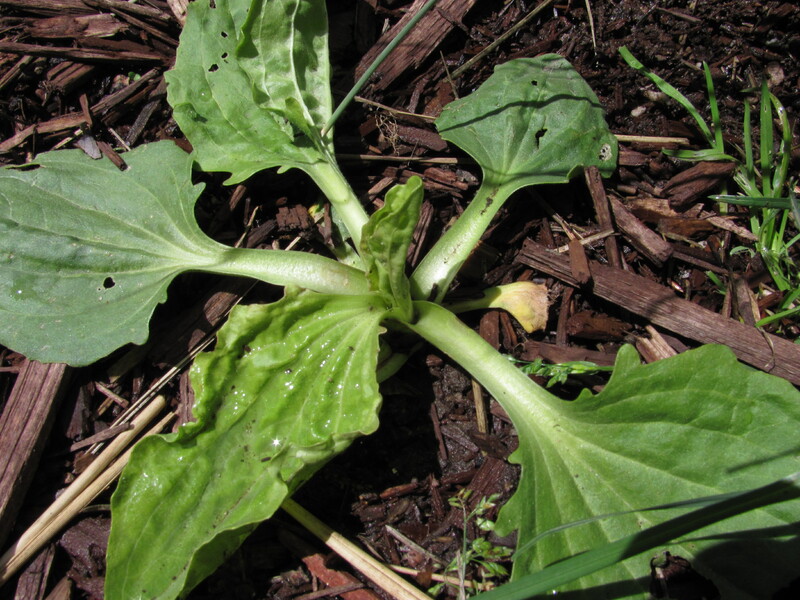 Check your unknown plant against Wyoming’s official noxious weeds list. Visit http://plants.usda.gov and click on the Invasive and Noxious Weeds link to find Wyoming’s list with links to photos of the species. The site also has a plant identification key. If you have a real weed, don’t poison it; just pull as much of it as you can before its roots develop. Definitely get it before it goes to seed. My front yard perennials grow so closely together they nearly completely shade out weeds. In other areas I depend on mulch. I use last year’s leaves and grass clippings a couple inches deep—after the self-seeding seedlings get established in the spring. Mulch in my new vegetable garden is also cutting down on the erosion of the edges of the wide beds. Be sure your lawn hasn’t recently had weed killer applied before using your clippings or they will kill your plants. Over the course of the growing season, as the mulch breaks down, you’ll have to add to it. Straw and pine needles are also recommended by experienced gardeners here. I am not fond of sheets of plastic or weed barrier cloth covered by rock or bark mulch around landscape plantings. I worked on a college grounds crew one summer and discovered the weeds punctured the plastic. All kinds of dirt and detritus, including weed seeds, blew in around the rocks. If you like rocks, make a rock garden. It will be less labor intensive than redoing rock mulch every year to keep it looking nice. Plus, vegetation cools the local environment in summer. –Keeps dry soil from blowing—though you may have to figure out how to keep the mulch itself from blowing away. If you find slugs under your mulch, maybe you need to water less often. Remove some of the mulch for awhile to let things dry out. For pros and cons of different kinds of mulch, pick up the Cheyenne Botanic Gardens’ tip sheet on mulching or find it at www.botanic.org. 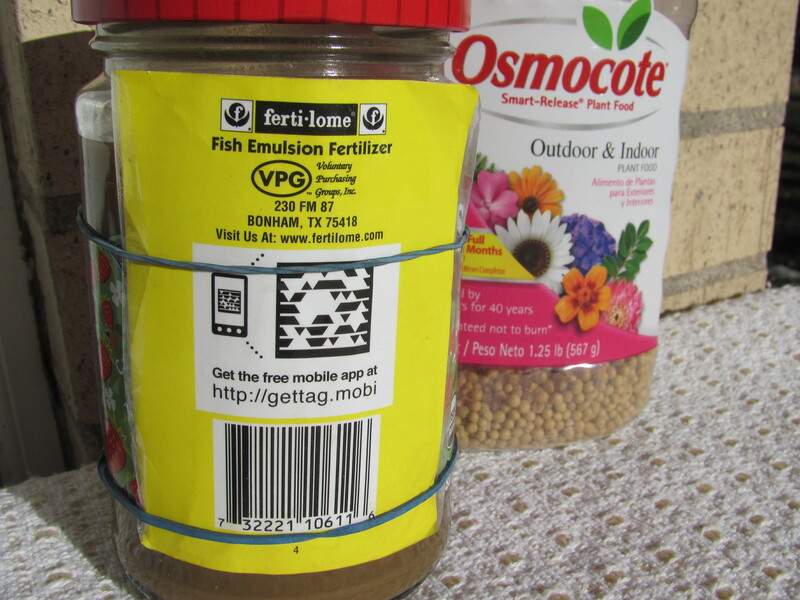 For perennials, I’ve never added fertilizer other than mulch that eventually composts, but my kinds of perennials are closely related to native wildflowers and are not classified as “heavy feeders.” I am, however, feeding my vegetables and annual flowers liquid fish emulsion as prescribed by the package directions. There are also compost “tea” recipes you might like to brew. See http://www.beginner-gardening.com/compost-tea.html. Next month, I’ll let you know how the drip irrigation installation went. Please send me your most common Cheyenne lawn and garden problems and I’ll look for solutions. Also, tell me what you do to protect your garden from hail. Categories: Garden maintenance | Tags: drip irrigation, fertilizer, fish emulsion, garden watering, mulch, Noxious Weeds, vegetable garden, weed seeds, weeding | Permalink.